We call it the Solution Facilitator’s Handbook. The unusual title comes from a classic Harvard Business Review article, ‘Management Time: Who’s Got the Monkey?’ And it’s more recent iteration by Steven R Covey, HBR. Our book gives you a brief understanding of Solution Focus and some tools to make life for your people much more productive. 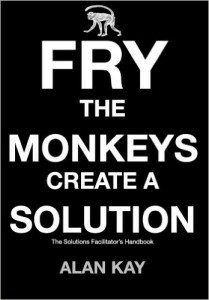 Fry the Monkeys – Create a Solution, by Alan Kay.